“The size of government is the only index where the Philippines ranks high. This is not a conscious effort, but instead the failure of our institutions like the Bureau of Internal Revenue and Bureau of Customs that are bad at revenue collection,” according to Dr. Felipe Medalla, Chairman of the Foundation for Economic Freedom. “Property rights in the country remain weak. Freedom to trade is superficial,” he added. 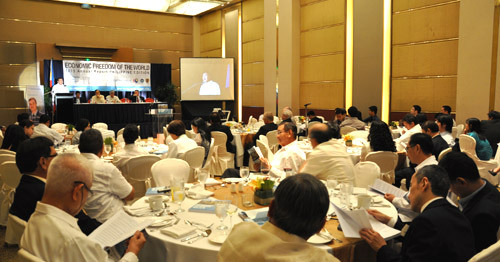 At the launch of the Philippine Edition of the Economic Freedom of the World (EFW) 2010 Annual Report on 28 October 2010 in New World Renaissance Hotel, the Philippine Economic Society (PES), Foundation for Economic Freedom (FEF), Center for Research and Communication (CRC), and Friedrich Naumann Foundation for Liberty (FNF) reaffirmed their commitment to defend economic freedom. Dr. Medalla, who served as Director-General of National Economic and Development Authority from 1998-2001, stressed that freedom is a value in itself. He explained that higher economic freedom may not necessarily result in higher income, but this cause and effect is “not as important as people’s rational preference for freedom.” “When in doubt, err on the side of freedom,” stated Dr. Medalla. He challenged PES, FEF, CRC, and FNF to take the lead in promoting economic freedom, “If not us, then who?,” Dr. Medalla dared. Mr. George Manzano of CRC and the University of Asia and the Pacific (UA&P) pointed out that the world condition affects how we value economic freedom. He cited the impact of the global financial crisis where deficit spending became “fashionable.” “Austerity is out, spending is in,” he quipped. Mr. Manzano recognized the importance of the EFW report in providing the framework in analyzing economic freedom and in monitoring the improvement of countries through time. The EFW Report analyzes the level of economic freedom in 141 nations. It measures economic freedom by 1) size of government, 2) legal structure and security of property rights, 3) access to sound money, 4) freedom to trade internationally, and 5) regulation of credit, labor, and business. The report reflects 2008 data where the Philippines is in the middle tier. The country’s ranking has been in steady decline since 2005. 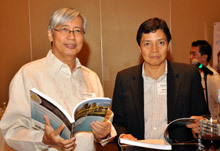 PES President Dr. Arturo Corpuz noted that the Philippines improved ranking would not yet show in the 2011 to 2012 EFW reports. “We look forward to the publication in two years when the efforts of the Aquino administration will be reflected in the statistics,” said Dr. Corpuz. 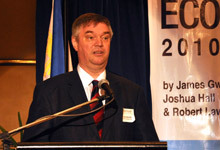 Mr. Jules Maaten, FNF Country Director, underscored the significance of economic freedom in promoting participation. “Economic freedom allows people to engage others in pursuit of economic benefits. It gives them the liberty to transact business and make choices based on their own judgments. It empowers each of us to take control of our own lives, which is the very essence of our liberal advocacy,” he emphasized. He announced that FNF would prioritize programs on fighting corruption the coming year in support of the efforts of the Aquino government.